The Winter Palace (Russian: Зимний дворец, tr. 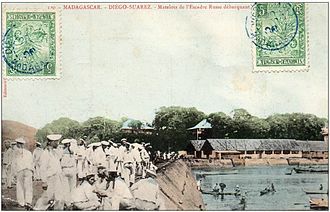 Zimnij dvorets, IPA: [ˈzʲimnʲɪj dvɐˈrʲɛts]) was the official residence of the Russian Emperors from 1732 to 1917. Today, the palace and its precincts form the Hermitage Museum. Situated between Palace Embankment and Palace Square, in Saint Petersburg, adjacent to the site of Peter the Great's original Winter Palace, the present and fourth Winter Palace was built and altered almost continuously between the late 1730s and 1837, when it was severely damaged by fire and immediately rebuilt. The storming of the palace in 1917, as depicted in Soviet paintings and Sergei Eisenstein's 1927 film October, became an iconic symbol of the Russian Revolution. 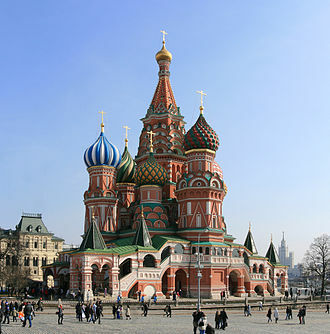 The palace was constructed on a monumental scale that was intended to reflect the might and power of Imperial Russia. From the palace, the Tsar ruled over 22,400,000 square kilometers (8,600,000 sq mi) (almost 1/6 of the Earth's landmass) and over 125 million subjects by the end of the 19th century. It was designed by many architects, most notably Bartolomeo Rastrelli, in what came to be known as the Elizabethan Baroque style. The green-and-white palace has the shape of an elongated rectangle, and its principal façade is 215 metres (705 ft) long and 30 m (98 ft) high. The Winter Palace has been calculated to contain 1,786 doors, 1,945 windows, 1,500 rooms and 117 staircases. Following a serious fire, the palace's rebuilding of 1837 left the exterior unchanged, but large parts of the interior were redesigned in a variety of tastes and styles, leading the palace to be described as a "19th-century palace inspired by a model in Rococo style". 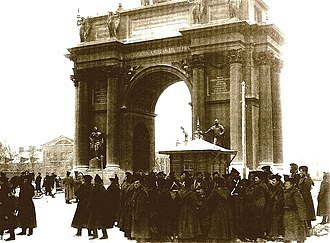 In 1905, the Bloody Sunday massacre occurred when demonstrators marched toward the Winter Palace, but by this time the Imperial Family had chosen to live in the more secure and secluded Alexander Palace at Tsarskoe Selo, and returned to the Winter Palace only for formal and state occasions. Following the February Revolution of 1917, the palace was for a short time the seat of the Russian Provisional Government, led by Alexander Kerensky. 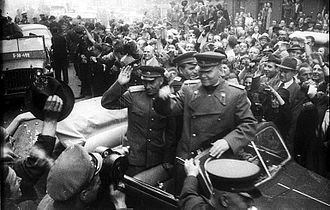 Later that same year, the palace was stormed by a detachment of Red Army soldiers and sailors—a defining moment in the birth of the Soviet state. 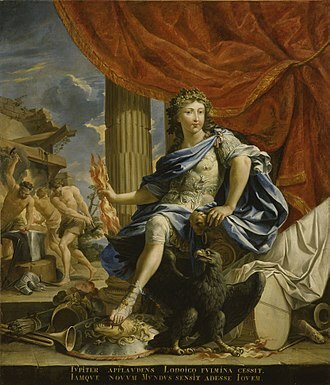 Upon returning from his Grand Embassy in 1698, Peter I of Russia embarked on a policy of Westernization and expansion that was to transform the Tsardom of Russia into the Russian Empire and a major European power. This policy was manifested in bricks and mortar by the creation of a new city, Saint Petersburg, in 1703. The culture and design of the new city was intended as a conscious rejection of traditional Byzantine-influenced Russian architecture, such as the then-fashionable Naryshkin Baroque, in favour of the classically inspired architecture prevailing in the great cities of Europe. 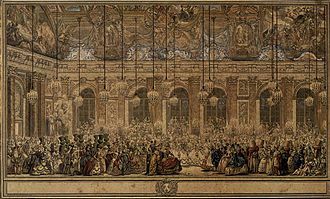 The Tsar intended that his new city would be designed in a Flemish renaissance style, later known as Petrine Baroque, and this was the style he selected for his new palace in the city. The first Royal residence on the site had been a humble log cabin then known as the Domik Petra I, built in 1704, which faced the River Neva. 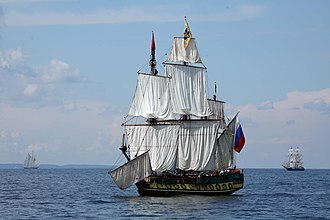 In 1711 it was transported to the Petrovskaya Naberezhnaya, where it still stands. With the site cleared, the Tsar then embarked on the building of a larger house between 1711 and 1712. This house, today referred to as the first Winter Palace, was designed by Domenico Trezzini. Ignoring the third Winter Palace, the Empress on her return to Saint Petersburg took up residence at the neighbouring Apraksin Palace. 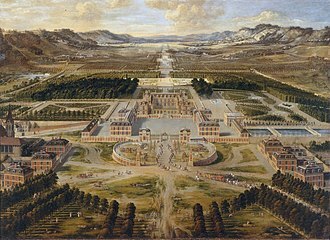 In 1732, the Tsaritsa commissioned the architect Francesco Bartolomeo Rastrelli to completely rebuild and extend the Apraksin Palace, incorporating other neighbouring houses. Thus, the core of the fourth and final Winter Palace is not the palace of Peter the Great, but the palace of Admiral General Fyodor Matveyevich Apraksin. 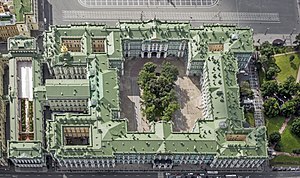 Unscaled plan of the 1st floor of the Winter Palace as it appears today, the fourth palace on the site. The numbers in this key are referred to throughout the article—click on numbers for images, pages and further details. 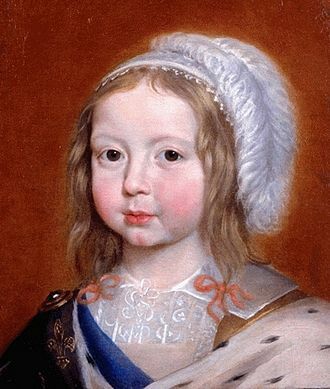 The infant Tsar Ivan VI, succeeding Anna in 1740, was soon deposed in a bloodless coup d'état by Grand Duchess Elizabeth, a daughter of Peter the Great. Delegating almost all powers to her favourites, the new Empress Elizabeth assumed a life of pleasure which led the court at the Winter Palace to be described later by the Russian historian Vasily Klyuchevsky as a place of "gilded squalor". In this way, between 1764 and 1781 Catherine the Great acquired six major collections: those of Johann Ernst Gotzkowsky; Heinrich von Brühl; Pierre Crozat; Horace Walpole; Sylvestre-Raphael Baudouin; and finally in 1787, the John Lyde-Brown collection. These large assemblies of art included works by such masters as Rembrandt, Rubens, Titian, Raphael, Tiepolo, van Dyck and Reni. The acquisition of 225 paintings forming the Gotzkowsky collection was a source of personal pride to Catherine. 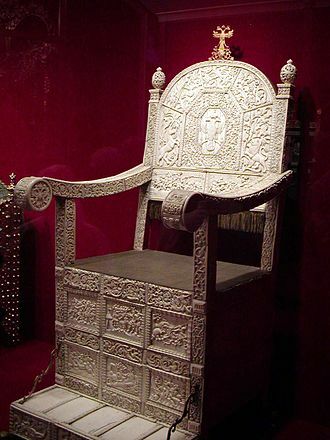 It had been put together by Gotzkowsky for Catherine's adversary, Frederick the Great of Prussia who, as a result of his wars with Russia, could not afford to pay for it. This collection included some great Flemish and Dutch works, most notably Frans Hals' "Portrait of a Young Man with a Glove." In 1769, the Bruhl collection brought to the Winter Palace two further works by Rembrandt, Portrait of a Scholar and Portrait of an Old Man in Red. Nicholas I was also responsible for the creation of the Battle Galleries (19), which occupy the central portion of the Palace Square façade. They were redesigned by Alexander Briullov to commemorate the Russian victories prior to 1812. Immediately adjacent to these galleries celebrating the French defeat, were rooms (18) where Maximilian, Duke of Leuchtenberg, Napoleon's step-grandson and the Tsar's son-in-law, lived during the early days of his marriage. After the death of Catherine the Great, the Hermitage had become a private treasure house of the Tsars, who continued collecting, albeit not on the scale of Catherine the Great. In 1850, the collection of Cristoforo Barbarigo was acquired. 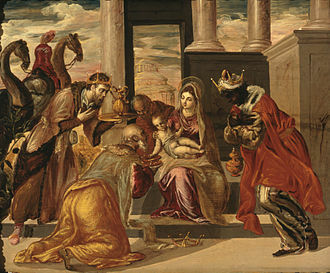 This collection from Republic of Venice brought into the Winter Palace further works by Titian, in addition to many 16th-century Renaissance works of art. 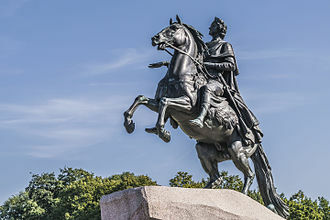 Nicholas I, conscious of the great art galleries in other European capitals, saw that Catherine the Great's Large Hermitage (15) was vastly expanded and transformed into a purpose-built public art gallery. 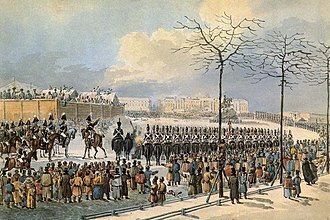 In 1839, German architect Leo von Klenze drew up the plans and their execution was overseen by Vasily Stasov, assisted by Alexander Briullov and Nikolai Yefimov. With so many architects involved there were inevitably many conflicts over the design and its execution throughout the 1840s, with the Tsar having frequently to act as moderator. Eventually, after eleven years of building and architectural conflict, the first art museum in Russia, the Imperial Hermitage Museum, opened on 5 February 1852. The trebeated facades of the building were inspired by Schinkelesque architecture. It was erected in grey marble round three courtyards and the complex is noted for the asymmetrical planning of its wings and floors. By order of the Tsar, visitors to the museum were required to wear evening dress, even in the morning. The Tsar also decreed that grey top hats were "Jewish" and dress coats "revolutionary." Having negotiated the dress code, what the public saw was a huge array of art, but only a fraction of the Imperial collection, as the Winter Palace and other Imperial palaces remained closed to the viewing public. In 1904, Russia was at war with Japan, and the newborn Tsarevich was secretly ill; the Tsar and the Empress permanently abandoned Saint Petersburg, the Winter Palace, and high society (considered by the Empress to be decadent and immoral) for the greater comfort, security and privacy of Tsarskoe Selo. Thus it was that the Winter Palace, designed and intended to impress, reflect and reinforce the Romanovs' power, lost its raison d'être over a decade before the fall of the dynasty it was intended to house and glorify. Forced to accept the hopelessness of both the war and the situation at home, on 15 March 1917, Nicholas II abdicated in favour of his brother, Grand Duke Mikhail Alexandrovich. 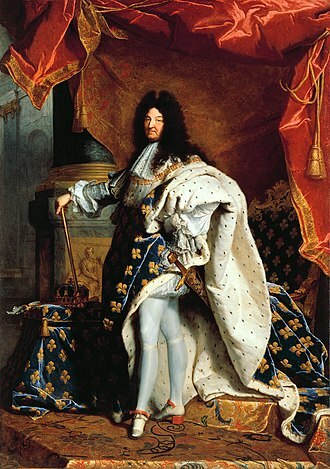 The Grand Duke promptly refused to accept the throne without the support of the army and his people. A provisional Government was appointed and many members of the former Imperial family were arrested, including the former Tsar, the Empress and their children. No member of the Romanov family have lived in the Winter Palace since the abdication in 1917 and very rarely did after 1905. Nicholas II, his wife and children were all held in captivity until they were murdered at Yekaterinburg in 1918. Other members of the former Imperial Family either met similar fates or escaped into exile. At 7:00 pm, the Government held its last meeting in the Malachite Room, with the telephone and all contact with the outside world disconnected. 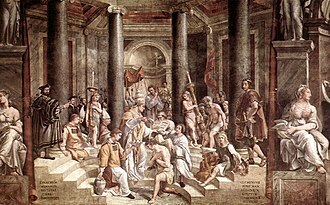 A short debate determined that they would not leave the palace to attempt dialogue with the hostile crowds outside. With the palace completely surrounded and sealed, the Aurora began her bombardment of the great Neva façade as the Government refused an ultimatum to surrender. Further machine gun and light artillery fire were directed at the palace as the Bolsheviks gained entry via His Majesty's own Staircase (36). 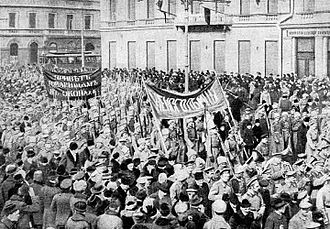 In the ensuing battle there were casualties on both sides until the Bolsheviks finally, by 2:00 am, had control of the palace. Leaving a trail of destruction, they searched room after room before arresting the Provisional Government in Small Dining Room of the private apartments(28), from where they were taken to imprisonment in the Fortress across the river. Kerensky managed to evade arrest and escape to Pskov, where he rallied some loyal troops for an attempt to retake the capital. 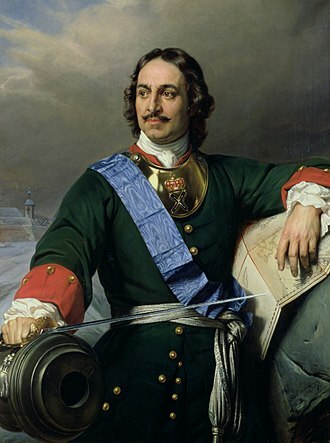 His troops managed to capture Tsarskoe Selo, but were beaten the next day at Pulkovo. 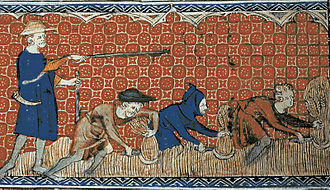 The Winter Palace's wine cellars literally fuelled the weeks of looting and unrest in the city which followed. Arguably the largest and best stocked wine cellar in history, it contained the world's finest vintages, including the Tsar's favourite, and priceless, Chateau d’Yquem 1847. So keen were the mob to obtain the alcohol, that the Bolsheviks explored radical solutions to the problem, one of which involved piping the wine straight out into the Neva. This led to crowds clustering around the palace drains. Another proposal, deemed too risky, was exploding the cellars. Eventually, the problem was solved by the declaration of martial law. It has been said that Petrograd, "perhaps with the biggest hangover in history, finally woke up and got back to some order." Soviet ski troops by the Winter Palace during the Leningrad Siege in 1943. Gates to the Winter Palace. The gilded emblems of Imperial Russia, torn down in 1917, are now fully restored. Today, as part of one of the world's best known museums, the palace attracts an annual 3.5 million visitors. ^ The numbering of the Winter Palaces varies. Most referees used in the writing of this page refer to the present palace as the fourth. That is: Trezzini, 1711 (I); Mattarnovy, 1721 (II); Trezzini, 1727 (III) and Rastrelli, 1732 (IV). Thus, to agree with the majority and because these four versions were "palaces" each differing from the last rather than recreations, this will be the numbering used here. However, other sources count the log cabin of Peter the Great as the first palace, while others discount Trezzini's 1727 rebuilding and others count the 1837 reconstruction as a 5th Winter palace. One source (not used here) numbers a temporary wooden structure erected to house the court during the building of the present palace. ^ In 1721, Tsar Peter I received the title of Emperor from the Governing Senate. Scholars use the titles of "Tsar" and "Emperor" (and their feminine forms) interchangeably. ^ a b Cowles, p. 49. ^ Brumfield, William Craft (October 1983). Gold in azure: one thousand years of Russian architecture. D.R. Godine. p. 264. Retrieved 13 April 2011. ^ Orloff, Alexander & Shvidkovsky, Dmitri (1996). Saint Petersburg: Architecture of the Tsars. New York: Abbeville Press. ISBN 978-0-7892-0217-8. ^ a b Amery, Colin; Curran, Brian (2006). St Petersburg. Frances Lincoln Ltd. p. 56. ISBN 978-0-7112-2492-6. Retrieved 13 April 2011. ^ "1787: Purchase of the John Lyde-Brown collection, London". State Hermitage Museum. Retrieved 13 April 2011. ^ a b c d e f "The Great Hermitage". State Hermitage Museum. Retrieved 13 April 2011. ^ Crankshaw, Edward (1976). The shadow of the winter palace: Russia's drift to revolution, 1825–1917. Viking Press. p. 53. ISBN 978-0-670-63782-9. Retrieved 13 April 2011. ^ "Winter Palace". StPetersburgRussia.ru. Retrieved 14 June 2015. 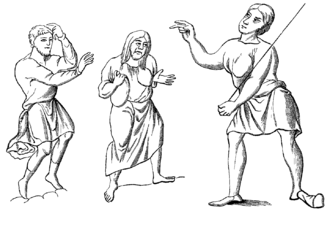 ^ Figures from King, p. 169. These figures are widely quoted. However, while the figure of 1,783 windows is likely, a figure of 1,500 rooms would have to include windowless basement rooms, multiple servants rooms in the attics and closets etc. Compare the 2000 rooms in the Vienna Hofburg and 1400 rooms of Schönbrunn, which is much smaller than the Winter Palace. Available plans given by the Hermitage Museum and the original 18th century plans do not show 1,057 rooms. Cowles, p88, claims the Winter Palace had 1,500 rooms, prior to the erection of the adjoining Hermitage. 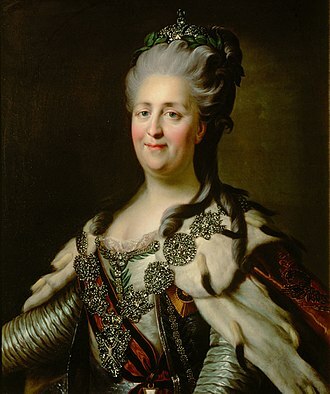 ^ a b "Catherine II (1762–1796)". State Hermitage Museum. Retrieved 13 April 2011. ^ Saint Petersburg Sights: a travel guide to the top 50 attractions in St. Petersburg, Russia (Mobi Sights). MobileReference. 2010. p. 84. ISBN 978-1-60778-932-1. Retrieved 13 April 2011. ^ The website of The State Hermitage Museum records the Duke living in these rooms, soon after his marriage to the Tsar's daughter, in 1839. The Tsar built the Duke and Duchess of Leuchtenberg the Marinsky Palace (completed in 1844), thus enabling the Duke to escape to what must have been less humiliating surroundings. ^ "Valse des fleurs". Sitwell, Sacheveral. Retrieved 27 April 2008. ^ a b c d "The Fire of 1837 and Restoration of the Winter Palace". State Hermitage Museum. Retrieved 13 April 2011. ^ Hayward, Richard Mowbray (1998). Russia Enters the Railway Age, 1842–1855. Boulder, CO: East European Monographs. pp. 42–47. ISBN 978-0-88033-390-0. ^ "The Winter Palace and museum". Saint-Petersburg.com. Retrieved 13 April 2011. ^ Letter to Queen Victoria from Lord Carrington. Quoted: Maylunas, p. 110. ^ Lord Carrington. Quoted: Maylunas, p. 110. ^ a b Watkin, David (2005). A history of Western architecture. Laurence King Publishing. p. 504. ISBN 978-1-85669-459-9. Retrieved 13 April 2011. ^ Persianova, Olʹga (1979). The Hermitage: room-to-room guide. Aurora Art. Retrieved 13 April 2011. ^ "Construction of the Public Museum". State Hermitage Museum. Retrieved 13 April 2011. ^ "1914: Purchase of Leonardo da Vinci's Madonna with a Flower (Benois Madonna)". State Hermitage Museum. Retrieved 13 April 2011. ^ "The Last Romanovs". State Hermitage Museum. Retrieved 13 April 2011. 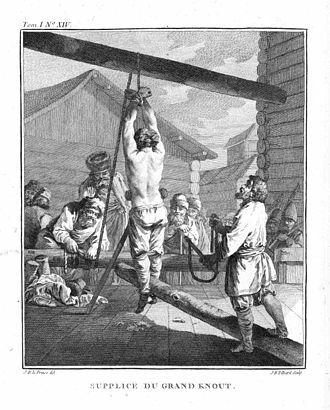 ^ Varshavskiĭ, Sergeĭ Petrovich; Rest, B. (1985). 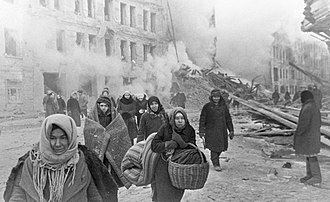 The ordeal of the Hermitage: the siege of Leningrad, 1941–1944. Aurora Art Publishers. p. 234. ISBN 978-0-8109-1406-3. Retrieved 13 April 2011. ^ Kāvere, Anne (2007). Rīgas dārzu arhitekts Georgs Kūfalts (in Latvian). Riga: Jumava. pp. 107–108. ISBN 978-9984-38-349-1. OCLC 191090541. ^ Grand Duchess Olga Alexandrovna of Russia who was present at the opening of the 1st State Duma in 1906. Vorres, p. 121. ^ "1914: Start of World War I. A hospital is opened in state rooms of the Winter Palace". State Hermitage Museum. Retrieved 13 April 2011. ^ a b c d e f g "How the Bolsheviks took the Winter Palace". The Guardian. UK (eyewitness account of the storming of the Winter Palace). Retrieved 13 April 2014. ^ Figes, Orlando (1998). 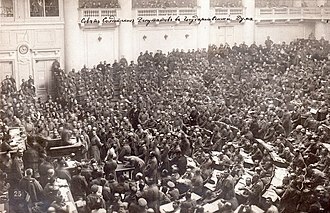 A people's tragedy: the Russian Revolution, 1891–1924. Penguin Books. p. 494. ISBN 978-0-14-024364-2. Retrieved 13 April 2011. ^ a b Figes, Orlando. "Storming the Palace". Cambridge University, PBS. Retrieved 13 April 2011. ^ Taylor, Richard. Film Propaganda: Soviet Russia and Nazi Germany. London: Croom Helm Ltd., 1979. 92–94, 101. ^ Brown, Douglas (1976). Doomsday 1917: the destruction of Russia's ruling class. Putnam. p. 60. ISBN 978-0-399-11615-5. Retrieved 13 April 2011. ^ "St Petersburg: Swiss Architecture on the Neva (Domenico Trezzini 1727)". Presence Switzerland, Berne, Switzerland. p. 4. Archived from the original on 16 December 2008. Retrieved 11 November 2008. Budberg, Moura (1969). Great Palaces (The Winter Palace). London: Hamlyn Publishing Group Ltd. pp. 194–201. ISBN 978-0-600-01682-3. Cowles, Virginia (1971). The Romanovs. London: William Collins,Sons & Company Ltd. ISBN 978-0002117241. "Explorations in Saint Petersburg". interKnowledge Corp. 1996–2005. Retrieved 20 April 2008. Faber, Tony (2008). Faberge's Eggs: One Man's Masterpieces and the End of an Empire. ISBN 978-0230713963. Hughes, Lindsey (1998). Russia in the Age of Peter the Great. New Haven, CN: Yale University Press. ISBN 978-0-300-07539-7. Klyuchevsky, Vasily (1926). A History of Russia (transl. C.J. Hogarth). London: Dent. Kurth, Peter (1995). Tsar: The Lost World of Nicholas and Alexandra. London: Little, Brown and Company. ISBN 978-0-316-50787-5. Malone, Richard (2009). Analysing The Russian Revolution (2 ed.). Australia: Cambridge University Press. ISBN 978-0-521-76608-1. Andrei Maylunas, Sergei Mironenko (1996). A Lifelong Passion. London: Orian Publishing Group Ltd. ISBN 978-0-297-81520-4. Norman, Geraldine (1998). The Hermitage: The Biography of a Great Museum. New York: Fromm International Publishing. ISBN 978-0-88064-190-6. Massie, Robert K. (October 1981). Peter the Great: His Life and World. New York: Ballantine Books. ISBN 978-0-345-29806-5. Mackenzie Stuart, Amanda (2005). Consuelo and Alva. Harper Collins. ISBN 978-0-00-721687-1. Petrakova, A. (3 October 2001). "Palace of Fedor Matveevich Apraksin". The Russian Antique. Archived from the original on 12 December 2008. Retrieved 24 March 2019. Stuart, D. (1982). Dear Duchess: Millicent, Duchess of Sutherland (1867–1955). London: Victor Gollancz Ltd. ISBN 978-0-575-03020-6. Vorres, Ian (1985). The Last Grand Duchess (3 ed.). London: Finedawn Publishers. ASIN B0007BI2NE. Francesco Bartolomeo Rastrelli was a French-born Russian architect of Italian descent. He developed an easily recognizable style of Late Baroque, both sumptuous and majestic and his major works, including the Winter Palace in Saint Petersburg and the Catherine Palace in Tsarskoye Selo, are famed for extravagant luxury and opulence of decoration. In 1716, Bartolomeo moved to Saint Petersburg, accompanying his father and his ambition was to combine the latest Italian architectural fashion with traditions of the Muscovite baroque style. The first important commission came in 1721 when he was asked to build a palace for Prince Demetre Cantemir and he was appointed to the post of senior court architect in 1730. His works found favour with female monarchs of his time, so he retained this post throughout the reigns of Empresses Anna, Rastrellis last and most ambitious project was the Smolny Convent in St. Petersburg where Empress Elizabeth was to spend the rest of her life. The projected bell-tower was to become the tallest building in St Petersburg, elizabeths death in 1762 prevented Rastrelli from completing this grand design. Tsarskoye Selo was the town containing a former Russian residence of the imperial family and visiting nobility, located 24 kilometers south from the center of Saint Petersburg. It is now part of the town of Pushkin, Tsarskoye Selo forms one of the World Heritage Site Saint Petersburg and Related Groups of Monuments. During the Soviet times it was known as Detskoye Selo, in the 17th century, the estate belonged to a Swedish noble. Its original Finnish name is translated as a higher ground. Max Vasmer, on the hand, derives this toponym from the Finnish word for island, saari. By the 18th-century at the latest, it was called Tsarskoye Selo, in 1708, Peter the Great gave the estate to his wife, the future Empress Catherine I, as a present. 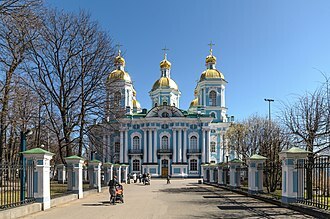 She founded the Blagoveschensky church there in 1724, and changed the name of the settlement to Blagoveschenskoye and it was Catherine I who started to develop the place as a royal country residence. Her daughter, Empress Elizabeth and her architect Bartolomeo Rastrelli were largely responsible for the building of the Catherine Palace, Empress Catherine II of Russia and her architect Charles Cameron extended the palace building that is now known as the Cameron Gallery. Currently, there are two palaces, the baroque Catherine Palace with the adjacent Catherine Park and the neoclassical Alexander Palace with the adjacent Alexander Park. The landscape Alexander Park has several Chinoiserie structures, notably the Chinese Village, by the end of the 18th century, Tsarskoye Selo became a popular place of summer residence among the nobility. The guards regiments were stationed to the south of Tsarskoye Selo, the five-domed neoclassical Ascension Cathedral, designed by Cameron, is the chief monument of that area. The Royal Forestry School, perhaps the first such school in Russia, was founded in Tsarskoye Selo in 1803, it was moved to Saint Petersburg in 1811, in 1808, Sophia and Tsarskoye Selo merged and became one town. In 1811, Alexander I opened the celebrated Lyceum next door to the Catherine Palace, among the first students of the Lyceum who graduated in 1817 were Aleksandr Pushkin and Alexander Gorchakov. 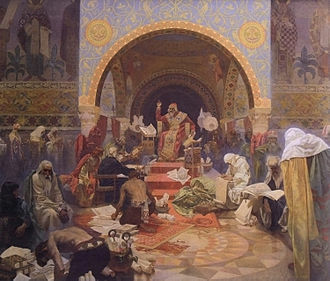 Mikhail Saltykov-Shchedrin graduated from the Lyceum, the literary traditions of Tsarskoye Selo were continued in the 20th century by such notable poets as Anna Akhmatova and Innokenty Annensky. 19th-century postcard of Pokrovka Street in Moscow. Location of the Jordan Staircase, within the palace.